Spicy Carrot and Radish Herb Salad | "blackberry-eating in late September"
food, in so many words. It’s dangerously easy to throw some greens into a bowl and crunch through them, but I think this is the kind of preparation that makes people think about salads as boring to make and to eat. With summer in gear and a series of weddings and reunions to attend within the next month or two, I find myself brainstorming salads creative and intriguing enough to hold my interest, so I can more easily convince myself to make choices that keep me responsible healthy fitting into my summer wardrobe. The easiest way of making a salad more exciting, it seems to me (besides just loading it up with cheese and some crisped pork product), is to take ingredients not usually used in a salad and jamming them in there anyway, lettuce be damned. For me, this generally takes the form of whatever dish I’ve been craving, transformed into something you can add an acidic vinaigrette and maybe a few crumbles of cheese to, toasting up a hunk of bread, and calling it dinner. This particular salad has two geneses. Lately I’ve been craving banh mi, with all its freshness and brightness, but I haven’t wanted to go through the whole production of making all the ingredients myself (which I’d insist upon, because I’m such a responsible foodie stubborn). Rather, I convinced myself, I wanted a salad inspired by a banh mi sandwich. What this meant was a collection of fresh and pickled vegetables, with some brightness from soft green herbs and some heat from jalapeño slices. 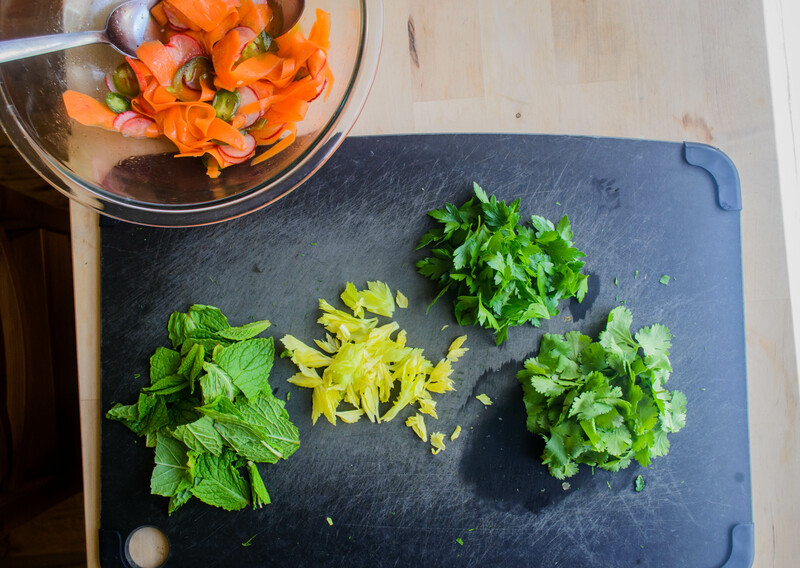 I dithered over the pickled part, reluctant to devote multiple days to preparing for a simple salad, until I remembered a grain salad my friend S. exalted about a few years ago featuring lightly pickled carrot slices, along with some jalapeño and mint. Wheels turned. 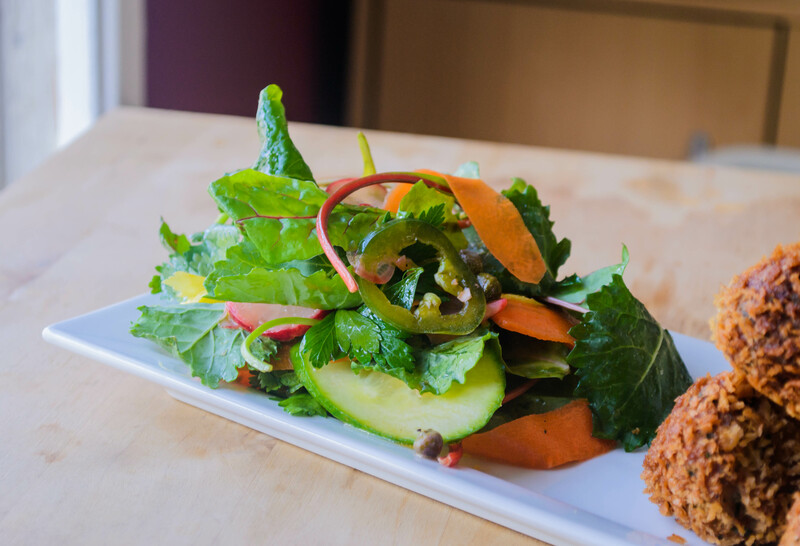 What we have here, then, is a salad that announces its summery freshness through bright, grassy herbs and crunchy cucumber, but still clings to the mild crispness of spring with ribbons of carrots and impossibly thin discs of radish. I find herb salads can get almost medicinal on the tongue, so a handful or two of baby greens tempers the sharpness of the herbs and the pucker of the vegetables after a 2 hour lemon juice bath, and brings this closer to what we usually think of as a salad. You could use any combination of greenery, but lately I’ve been obsessing over the “power to the greens” package from Trader Joe’s – baby chard, kale, and spinach, all tender enough that no stem removal is necessary. Add jalapeños, which I’ve put through the pickling process but you can certainly leave fresh, and you have a salad that pairs happily with almost anything. Serving suggestions: I can see this making a perfect base for grilled steak or salmon, with or without the addition of some tangy crumbles of goat cheese. I risked all to have it as a side for last week’s crab and shrimp balls, and though there’s a certain digestive peril to the fried + spicy pairing, hey, that’s what alka-seltzer is for. You could even force this back to its banh mi inspiration roots and stuff it inside a baguette or maybe a pita, with or without a protein accompaniment. In all cases, I’d recommend something sparkling to drink alongside – maybe a crisp prosecco or a hefeweizen with a thick wedge of citrus, or, if you prefer to go alcohol-free, a frosted glass of ginger beer with lime, for an intriguing contrasting spice. Prepare carrots, radishes, and jalapeño. 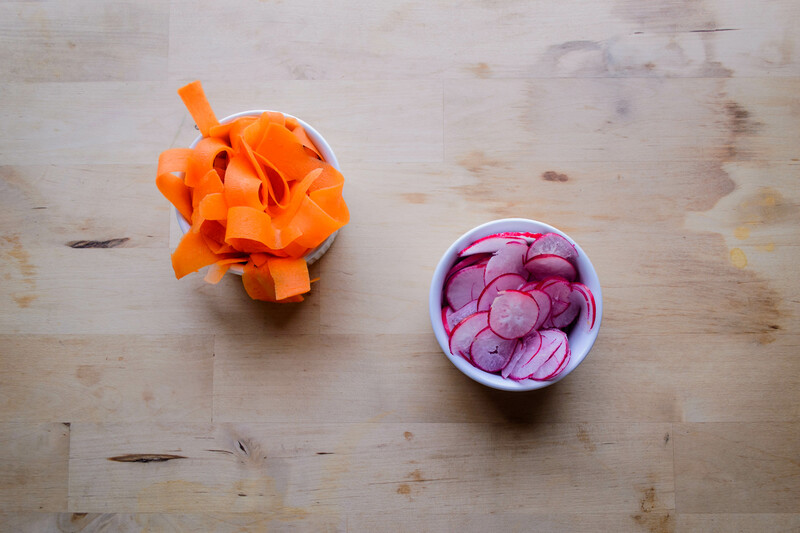 To make the carrot ribbons, peel carrots, then continue shaving off long pieces with your peeler from one side only. When the carrot gets concave and it’s difficult to make complete ribbons, flip it over and begin the shaving process again. Slice the radishes and jalapeños as thinly as you can or, if you are fancy, use a mandolin slicer (watch your fingers!). For a quite spicy salad: In a large bowl, whisk together 3 tablespoons of lemon juice with 2 tablespoons of olive oil. Add salt and pepper to taste. 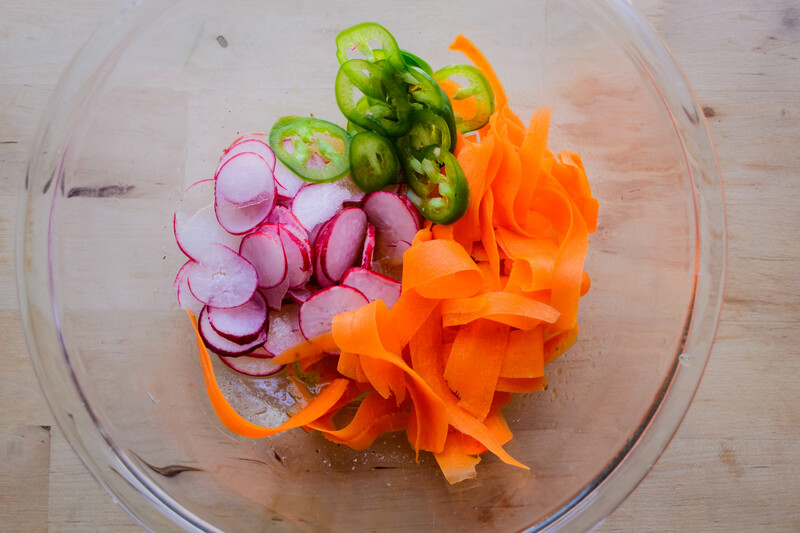 Add the carrots, radishes, and jalapeños, toss gently to distribute, and allow them to marinate for about 2 hours. They will soften, pickle slightly, and the vegetables and dressing will take on the spice of the jalapeños. After 2 hours and just before serving, add the capers, cucumbers, herb leaves, celery leaves (if using), and mixed baby greens to the bowl and toss lightly to combine. Lift out with clean fingers or tongs, let excess dressing drip off a bit, and position on serving plates. For a moderately spicy salad: In a large bowl, whisk together 3 tablespoons of lemon juice with 2 tablespoons of olive oil. Add salt and pepper to taste. Add the carrots, radishes, and jalapeños and allow them to marinate for about 2 hours. They will soften, pickle slightly, and the vegetables and dressing will take on the spice of the jalapeños. After 2 hours and just before serving, lift the lightly pickled carrots, radishes, and jalapeños out of the bowl and set them aside for a moment on a paper towel. Discard the remaining liquid in the bowl and wipe clean. In the clean bowl, whisk together the remaining 3 tablespoons lemon juice and 2 tablespoons olive oil. Season to taste with salt and pepper. Add the vegetables back in, then gently toss with the capers, cucumbers, herb leaves, celery leaves (if using), and mixed baby greens. Lift out with clean fingers or tongs, let excess dressing drip off a bit, and position on serving plates. For a mildly spicy salad: In a large bowl, whisk together 3 tablespoons of lemon juice with 2 tablespoon of olive oil. Add salt and pepper to taste. Add the carrots and radishes and toss gently to distribute. In another, smaller bowl, combine the jalapeño slices with 1 tablespoon lemon juice and a bit of salt and pepper. Allow all vegetables to marinate for about 2 hours. They will soften and pickle slightly, but the spice will not infiltrate the carrots and radishes as in the above preparations. After 2 hours and just before serving, add the capers, cucumbers, herb leaves, celery leaves (if using), and mixed baby greens to the bowl with the carrots and radishes and toss lightly to combine. Drain the lightly pickled jalapeños from their lemon juice bath and add them to the salad as well, tossing gently again to combine. Lift out with clean fingers or tongs, let excess dressing drip off a bit, and position on serving plates. Serve immediately – salad left in its dressing wilts quickly and loses its crisp appeal. 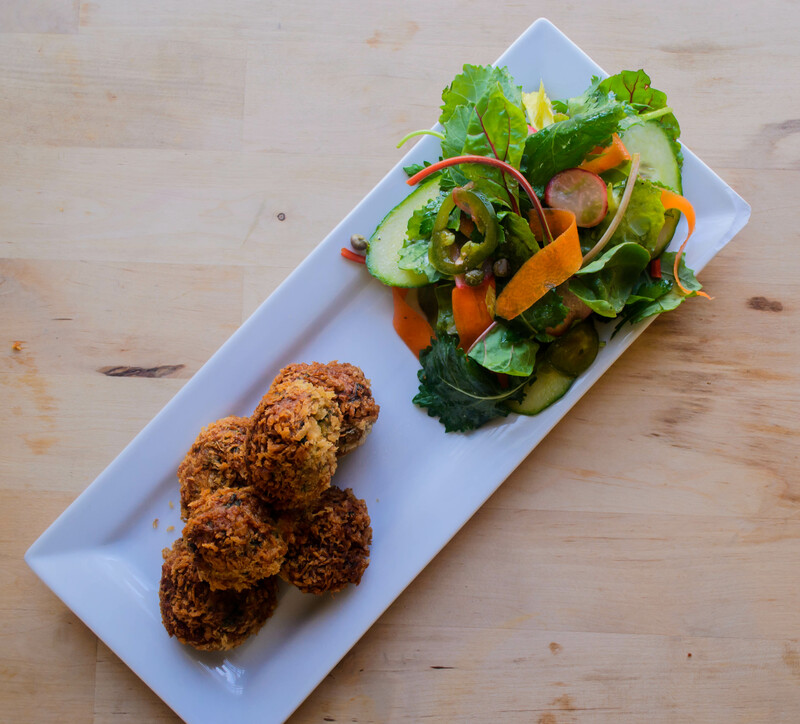 This entry was posted in Appetizers, Gluten-free, herbs, Recipes, salad, vegan, vegetarian, Veggies and tagged carrot, jalapeno, radish by Chelsea. Bookmark the permalink. thanks! it was really fresh and bright (though I’ll admit to feeling quite warm by the end of my mammoth serving – I must have ended up with a pretty spicy jalapeno!). Again, Hannah, you are on point. This comment made me laugh, because the friend who I got the idea for this salad from bulked up her version with farro! If I remember correctly, she even considered adding some veggie sausage slices into the mix, just to create a complete meal. I think some room temperature grain would be great. I’ve also thought about it as a filling for a pita stuffed with falafel and some yogurt – there the heat would be mitigated a bit, and I think the flavor combination and pickled sharpness would still work well. So glad you’re back visiting again!